Clinicians Emma Ford and Lizzie Olmstead (and Charlie). Photo by Lynsey Ekema. 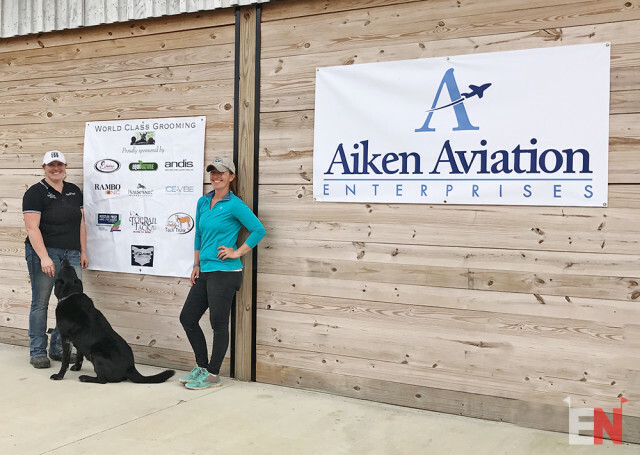 The Aiken Horse Park Foundation hosted a World Class Grooming Clinic with Emma Ford and Lizzie Olmstead at beautiful Bruce’s Field on Monday, and I was lucky enough to observe. Emma is the head groom for Olympic individual bronze medalist Phillip Dutton. She has groomed at almost every four-star event in the world, as well as multiple Olympic, World and Pan American Games. Lizzie started her eventing career with the O’Connor Event Team. 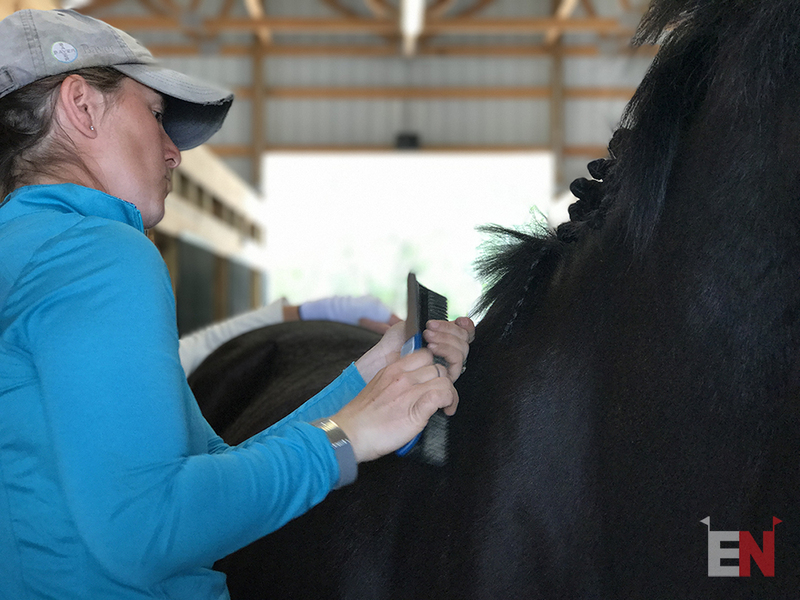 After working there for five years, she went on to be head groom for Jan Byyny, where she groomed at multiple international events around the world. She now runs LCO Eventing with fellow equestrian/husband Courtney and their two children. Caroline Moran sponsored breakfast for the clinic participants, while Jack Wetzel sponsored lunch. Photo by Lynsey Ekema. A waiting list for this special featured clinic brought a crowd of 32 multi-discipline equestrians to learn from the pros. 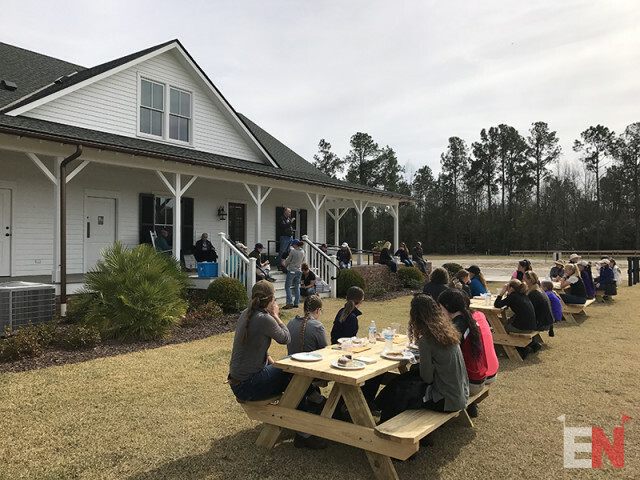 The participants were split into two smaller groups for four sessions each. The sessions with each groom were an incredible learning experience with plenty of time for the participants to ask questions. Each group participated with hands-on experience accompanied by phenomenal horses. Thank you to Daniel F. Geitner Stables for providing some additional horses for demonstration purposes! The Posture Prep is a go-to item in Emma’s grooming box. Photo by Lynsey Ekema. Emma believes that most of her success depends on her ability to be compassionate for the animals and atmosphere she works in. 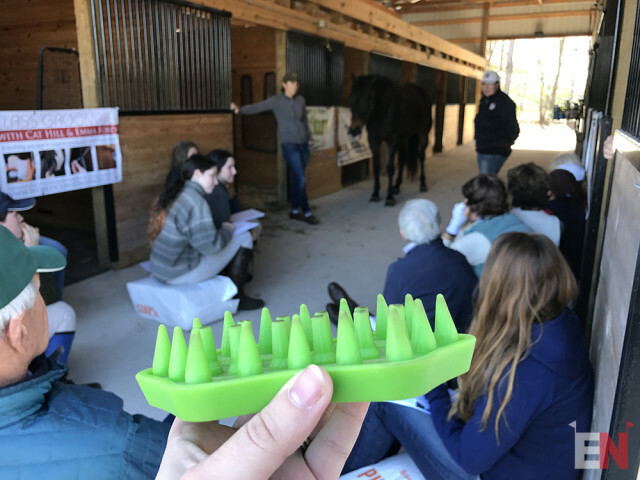 The session started on the basics of horse care and the importance of knowing your horse’s TPR — temperature, pulse, respiration — before calling the vet when issues arise. Good nutrition and good grooming are key. Emma emphasized good old fashioned currying with her favorite product, the Posture Prep. This massaging curry comb had an immediate positive effect in the demeanor of the horse she groomed. Working the comb from the hind end towards the front allows for a greater energy release from the powerful hindquarters into the rest of the body. Remove blanket straps in the correct order. Remove the leg straps first (always re-hook them back to the blanket for safety), followed by the chest straps, then lastly remove the belly straps so if something were to go amiss the blanket would be more likely to slide backwards and off the horse. Regardless of the type of method you use for icing, Emma recommends to ice for 20 minutes at a time and to always ice twice. Ice boots offering cold submerging of the hoof are best for horses suffering from front leg or concussion issues. Familiar with a static-puffed tail? Emma suggests using Equinature No Shock Anti-Static Grooming Spray to help eliminate this problem. Emma is a firm believer in using witch hazel to combat skin issues because of its ability to remove dirt without drying the skin. Rubbing alcohol has its uses but can be harsh on the skin. 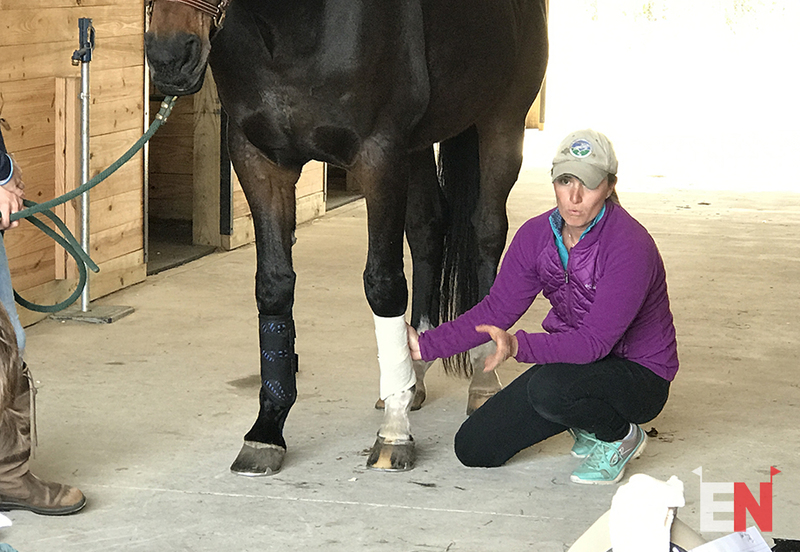 Lizzie demonstrates the proper way to put on a Majyk Equipe cross country boot and Tubigrip. Photo by Lynsey Ekema. Lizzie gave hands-on experience to those who had never wrapped equine legs before, a must know and from a true pro! While the age-old debate of the best boot was discussed, Lizzie emphasized that boots must be effective in protection but also lightweight and breathable. Two boots recommended in the clinic were Majyk Equipe Cross Country Boots and the Premier Equine Air Cooled Boots. Apply even pressure when wrapping and err on the side of caution to not create a leg wrap that is too tight. Using only flannel wraps for legs will help prevent bows. Boot rubs can be avoided by using pantyhose or Tubigrip stockings, which are placed on the leg first under cross country boots and folded over the top and bottom to overlap, followed by tape or Vetrap. Try using Equinature LegDown Liniment under a leg wrap instead of using poultice. If you still like poultice better, sheets of poultice from STAYONS avoid the mess. Pay attention to the rules. Many FEI competitions are now weighing show jumping boots, so you need to make sure your equipment follows appropriate regulations. Make sure to err on the side of caution with sizes of studs, as extra torque will cause strain on horses with front limb issues. Emma demonstrates her clipping technique using Andis clippers. Photo by Lynsey Ekema. If you take the whiskers off, leave the eyelashes unclipped. This helps provide the horse with a bit of natural feeler. If head shy, some horses respond well to cupping the eye for troublesome areas (bridlepath, around the face). Avoid products containing silicon as these tend to dry out the skin on the horse. For helping to regrow hair on areas of blanket rubs, try products like BB Super Gro or MTG. Always use a witch hazel towel bath or bathe the horse prior to clipping. For post clipping skin care, in a small bucket mix 1/4 organic apple cider vinegar and 3/4 water, plus a few globs of Shapley’s Oil. Sponge it on, then scrape. Lizzie demonstrated sew-in braids with wax thread, her preferred method. Photo by Lynsey Ekema. Lizzie presented her demonstration on how to draw quarter marks using water mixed with fly spray, wetting the quarters before using a small square comb to make the desired marks. She also demonstrated her method of sew braiding with wax thread and the proper way to pull a mane. Ivory soap is the “go-to shampoo” as it is all-natural and avoids chemical irritation. Condition the tail at least once a week. For grey tails, she recommends using Tide with bleach to get the dirt out, followed by a tail conditioner to keep it healthy. Use Shapley’s Hi Gloss Finishing Spray for dark points on a horse at competitions. Paprika can be fed to horses to darken their coats, but be aware that paprika may not be allowed in competition for certain regulated disciplines. Always check the rules. For thin forelocks on darker horses, Lizzie uses dark yarn braided into the forelock to help provide more mass for the braid. One big reason to attend a World Class Grooming Clinic: prizes for the participants! Photo by Lynsey Ekema. You need compassion and attention to detail to truly know your horse. Every equestrian has personal preferences, many based on experiences. Emma prefers yarn braids while Lizzie uses sew braids with wax thread, but they both certainly prefer Ivory soap for cleansing, along with all-natural products. Both Emma and Lizzie mentioned the positive changes in horses they have witnessed firsthand in using Ionic. All the Rambo Ionic products are making waves of innovation with their ability to promote blood flow without adding the extra heat. One lucky individual was able to win a pair of Rambo Ionic Wraps to take home — another perk of the clinic! Additionally, Emma recommended using FLAIR Equine Nasal Strips on cross country for Preliminary horses and above. Horses have a 1:40 air-intake ratio, and FLAIR strips can help horses produce up to 40% more air. Keep FLAIR strips on until the horse has completely cooled out. Thank you to all sponsors for this clinic! Title sponsor Aiken Aviation provided a free copy of World Class Grooming for Horses for each participant. Other sponsors included Jack Wetzel, Caroline Moran, Horseware Ireland, Equinature, Shapley’s Products, Teddy’s Tack Trunk, Andis Grooming, Hands On Gloves and Posture Prep. 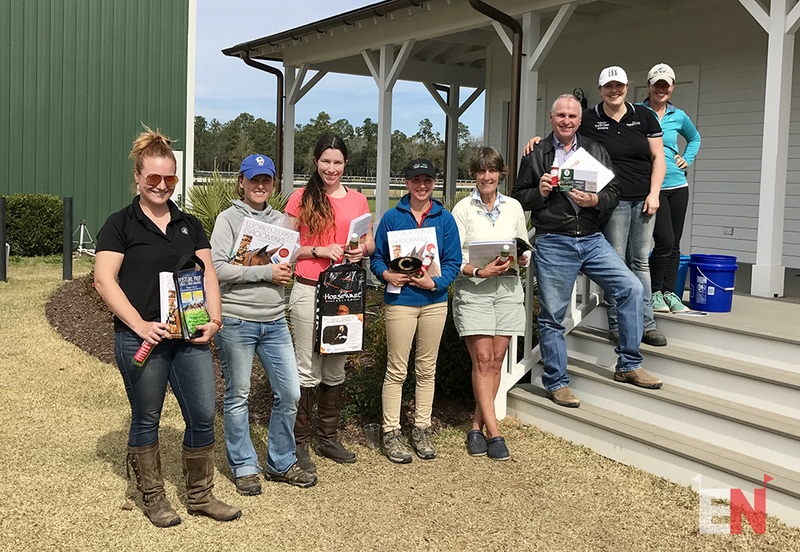 A portion of the proceeds benefited Equine Rescue of Aiken, which promotes adoption for retired racehorses, rescues unwanted horses and takes in horses whose owners can no longer care for them. 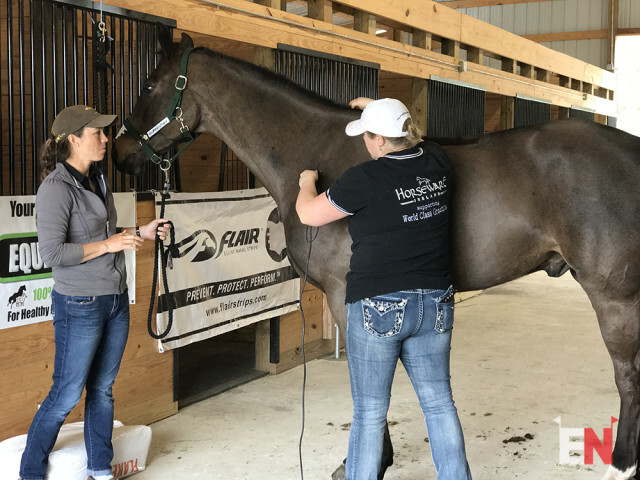 If you were not able to attend this clinic with two master grooms of the sport, be sure to check in with WorldClassGrooming.com to sign up for a future clinic. You can also pick up a copy of Emma and Cat Hill’s fantastic book World Class Grooming for Horses to learn more. About the author: Lynsey Ekema is a medical illustrator/application developer at Augusta University and also runs Fraulein Design LLC, a freelance graphic design business. She considers herself lucky to live amongst fellow equestrians in Aiken, South Carolina. From experience as a working student in South Jersey, to a hired groom for Olympic rider Nina Ligon, and a continued student of three-star eventing trainer Jodi Hemry, Lynsey is able to help equestrian professionals through marketing and media with years of experience and passion in the sport.